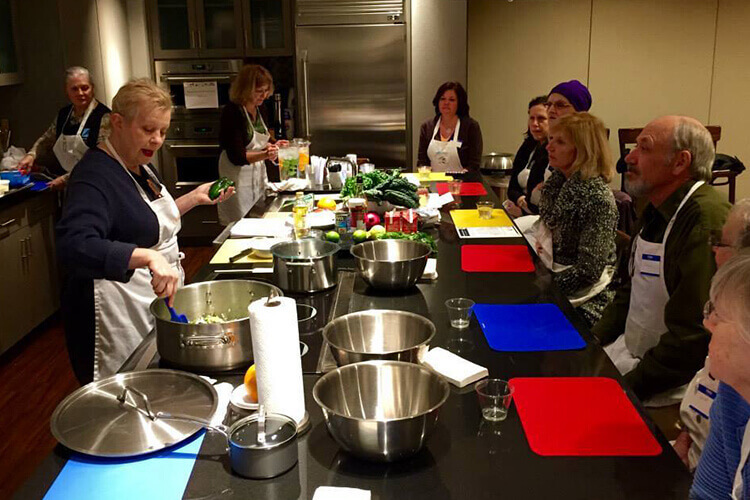 Teaching healthy cooking to people touched by cancer. The American Institute of Cancer Research estimates that more than 1/3 of the most common cancers could be prevented through healthier eating and lifestyles. Since 2007, Cook for your LIFE has provided in-person and online healthy cooking classes in English and in Spanish free of charge. Our mission is to teach the wider cancer community of patients, caregivers and survivors how to live better, healthier lives through providing 101 education about healthy food, and by teaching the basic cooking skills needed to succeed in improving diet for better overall health outcomes. Our story began when founder Ann Ogden Gaffney took a break from a successful fashion career to focus on the treatment of her second cancer. As she became immersed in the world of hospitals and cancer, she became aware of the disconnect between getting information on healthy eating and nutritional meals during cancer treatment, and the practical skills needed to get them on the table. Ann is a skilled cook, and was easily able to adapt recipes to help her cope with the treatment side effects and eat well even on her worst days. However, for many of her fellow cancer patients in the chemo suite, lack of expertise in the kitchen made it overwhelmingly difficult for them to cope. To help, Ann started sharing her own cooking tips and advice, which eventually led to her first free hands-on cooking class organized with the hospital. In 2007 she founded Cook for Your LIFE. Ann and Cook for Your LIFE have come a long way. As of writing our subscription free website has served some 5 million visitors and we have taught hands-on classes to over 12000 in the NYC area. Cook For Your LIFE has grown to become a trusted free resource to both cancer patients and nutritionists—teaching cancer patients how to cook their way to healthy survivorship, and enabling nutritionists to offer their cancer patients much more than a just a draconian list of foods to eat. We recently made the Feedspot Top 100Health Blog list. Cook For Your LIFE has also been an integral part of 2 successful peer reviewed National Institutes of Health funded studies in the Latina breast cancer community, both in collaboration with researchers at Columbia University’s Mailman School of Public Health. Who is Ann? Learn more about our wonderful founder. Chelsea joined Cook For Your Life in 2011 as the Director of Marketing and Website. Although she is now studying to be a... nurse practitioner at CUNY, Chelsea is still involved with the organization as the Recipe and Food Editor, and oversees all recipe content for our website blog and online videos. Originally from Boulder, CO, Chelsea earned a bachelor’s degree in journalism from The New School, specializing in non-fiction writing and food studies. She was also the co-founder and CEO of Iko Ino, a NYC-based brand development and marketing firm. Annette Mia is the point of contact for all things Instagram and Pinterest related at Cook For Your Life and Cook For Your Life Español. Coming to NYC after... graduating from Texas State University with a bachelor of fine arts degree, she founded a non-profit production company that produces viral videos, short films, and TV pilots. She has overseen the social media content for NYC restaurants and food-based companies and was the project manager for the app LiveDish. She is very involved in the local food scene, incorporating her filmmaking and marketing skills to create a community of food lovers. Linda brings over 35 years of experience in planning and executing innovative marketing, public relations, social media and branding campaigns and special events.... Prior to joining Cook for Your LIFE, she was an independent brand strategist and consultant, serving a diverse range of businesses and non-profit organizations. She was the founder and president of a public relations and event management agency specializing in jewelry and luxury brands, and the co-founder of the Women’s Jewelry Association, which now has over 1,500 members worldwide. Compassionate and caring to those in need, she is a long-time volunteer with God’s Love We Deliver and was on the founding board of Gilda’s Club Worldwide. Victoria was born in the Dominican Republic and moved to the United States when she was 11 years old. It was during college at Rutgers University, where she earned a bachelor’s degree in journalism and Spanish,...that she discovered her passion for visual storytelling and started creating her own videos. She is responsible for the videography, directing, editing, transcribing, and voice-over dubbing for Cook For Your Life’s cooking videos, special events, and cooking demonstrations. She has produced visual content for companies including Emporia Entertainment, Turitmo.com, Kesta Happening DC, and the Brick City Bhangra dance team of Newark, NJ.